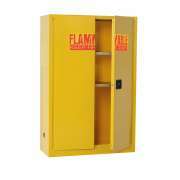 Flammable Liquids Safety Cabinet with 2 Shelves-60 Gal. Where is the safest place to store chemicals? 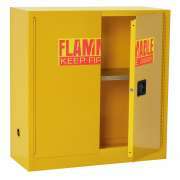 A locking steel safety cabinet with a clear warning on the outside is the best place to keep flammable liquids and other chemicals. Whether you are furnishing a school science lab or a janitor’s closet, keeping things safely stowed away is extremely important, especially if you have children or students in your facility. Unlike standard steel cabinets, chemical cabinets have leak proof doors, so even if something potentially dangerous spills, the spill is contained and won’t spread. We also have cabinets that are built into a lab safety station so you can keep any emergency first aid equipment handy right next to the lab shower and eyewash. What is special about a safety cabinet? While regular steel cabinets may have locking doors, a safety cabinet includes many extra features that make it a better choice for chemical storage. 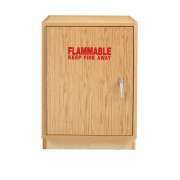 A clear warning on the outside of the cabinet stating that flammable liquids are inside ensures that no one accidentally comes near the cabinet with an open flame. Clear labelling also prevents people from getting confused about the contents and encourages everyone to be meticulous about locking up when the cabinet doesn’t need to be open. 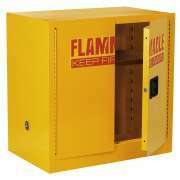 In addition to the clear warning on the outside, a flammable storage cabinet is also built differently than a standard design. Sturdy shelves with a high weight capacity won’t get bent out of shape, which protects against potential spills when opening the cabinet and ensures that containers remain upright. Leak-proof doors ensure that in the highly-unlikely event that something does spill because of careless placement, none of the liquid will go outside of the cabinet. What should be put in a safety cabinet? A chemical cabinet is meant for any substances that should not be used without supervision. The most common place to put one is in a science lab where chemical experiments are conducted. In such a space, you want to have materials on hand but safely stowed away when not in use. 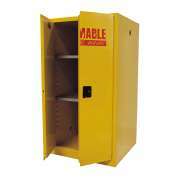 Having a safety cabinet mounted on the wall is an ideal arrangement. Another space where one could be helpful is in a janitor’s closet where cleaning supplies are stored. Any school or community center should have all cleaning products stored safely away to protect children and other visitors. Can I get a lab safety station with storage? Chemical storage cabinets aren’t the only kinds of cabinets that can enhance safety in a lab. 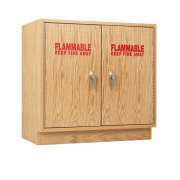 A wooden lab safety station with a built-in eyewash and shower as well as cabinets is a smart purchase. This setup keeps everything you need in the unlikely event of an accident in one clear space. Upper shelving and side cabinets accommodate whatever safety supplies and first aid products you might need while an open space underneath fits a fire extinguisher and makes the whole station wheelchair accessible.